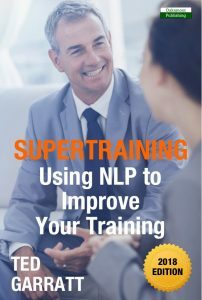 There are many NLP techniques, focussing on all sorts of objectives, but two – which are of particular importance within the training environment – are calibration and congruence. In this extract from the book by Ted Garratt, learn more about them both. Calibration is a baseline NLP skill. A definition of calibration is: reading, fine-tuning and being sensitive to a person or group’s non-verbal behaviour. In order to achieve effective calibration, it is necessary to pay high-quality attention to learners’ physiology. It also requires being in ‘uptime’, i.e. focused outwards, and picking up on and recognizing relevant signals. Like all NLP skills, many trainers will already do this naturally and instinctively. Take a particular facet, e.g. breathing, and calibrate to an individual, group or whole course. Take another facet and do the same, e.g. Physiology. Gestures. Postures. Eye accessing cues. Voice tone, pitch, pace, etc. Start to combine the above until doing all of them becomes habitual. Start to notice the moment of change (i.e. when do learners shift their posture, use certain mannerisms?). – A baseline NLP skill. – Based on non-verbal behaviour. – Requires paying high-quality attention. – Need to be in uptime, i.e. focused outwards. On an appraisal skills training course, one person was very quiet and detached, offering nothing either in the open sessions, or even the syndicate sessions. Direct questions to the person caused obvious embarrassment and drove him even further into his shell. His skin colour changed dramatically, and his breathing pattern became shorter, sharper and higher in his chest. Over a break, a conversation was started with him, indirect questions asked regarding his role, reasons for attending the course, and what would be expected of him afterwards. It transpired that he was worried about having to do appraisals for the first time, and that his credibility might be damaged. At this point, individual outcomes were agreed for him, chosen by himself. It was also agreed that the course itself was an opportunity for him to practise and develop the required skills, both through the syndicate sessions, open forums and role-plays. Again specific outcomes were agreed for the day along with appropriate tasks. The difference in physiology, breathing rate, etc. changed dramatically as the day went on, and in the mini-review which took place at the end of the day, he looked and sounded completely different. Congruence is about the alignment and consistency of the message and how it is put across and received. If there is no congruence on the part of the trainer, the learners will receive mixed and different meanings. A useful way to look at it is being in rapport with oneself. This is one aspect where the trainer as role-model is key; where walking the talk and talking the walk becomes visible and evident to the learner. – The alignment of the message and how it is put across in terms of body language, voice, tone, language. – The trainer as role-model. – The alignment of beliefs and values with the message and the actions of the trainer. Use third position to self-check for congruence. Go inside and check kinaesthetically (feelings, sensations and emotions). If there is a lack of alignment at some level, you will know if this is happening. Practise finding a form of words, gesture, posture, etc. that conveys the aligned message you wish to express. – Congruence is about alignment and consistency. – Lack of congruence will send out mixed signals. – It is about being in rapport with self. – It is about aligning the message with how it is delivered, the trainer as a role-model and living the beliefs.